Sorenson introduces a lightweight, affordable instrument for your bench top. You know us as a liquid handling company, a leading provider of quality plastic consumables. Sorenson products are used in research labs worldwide and include pipette tips, PCR products, microcentrifuge tubes, MµltiFlex gel loading tips, and the innovative, ergonomic and environmentally-friendly OneTouch tips. 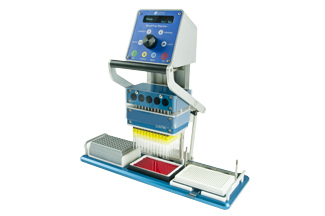 And now, you can expect the same high quality you have come to expect in Sorenson products with the BenchTop Pipettor, a portable, affordable, semi-automated 96/384 pipetting platform. Accelerate your liquid transfers with the BenchTop Pipettor.